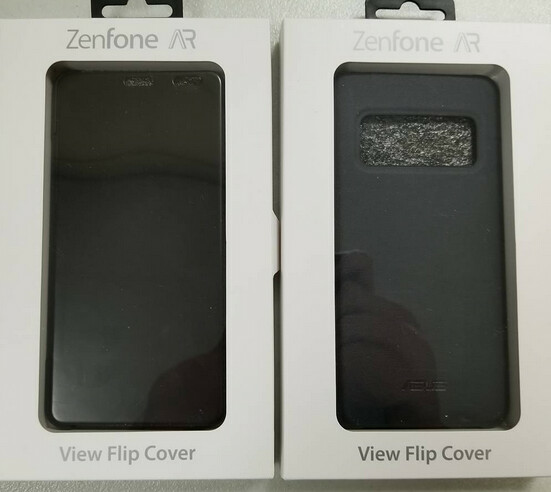 A photo that shows an image of what appears to be a case for the Asus ZenFone AR could be a hint that we can expect the handset to be launched soon in the U.S. The device, which supports Google's AR focused Project Tango, was unveiled in January at the CES in Las Vegas with 8GB of RAM (the first handset to carry such an amount), and three cameras including a 23MP primary snapper. Other cameras on the device track motion and depth. With the AR capabilities, the handset can create 3D indoor maps and much more. Back in May, we told you that Verizon is expected to offer the handset this summer in the U.S. Big Red's variant of the ZenFone AR is rumored to feature 6GB of RAM instead of the 8GB loaded into the device at the unveiling in Vegas, and in units spotted overseas. Other specs include a 5.7-inch Super AMOLED display carrying a 1440 x 2560 QHD display. Powering the handset is the Snapdragon 821 chipset with a quad-core 2.15GHz CPU and the Adreno 530 GPU. 128GB of native storage is aboard. Keeping the lights on is a 3300mAh battery, and Android Nougat is pre-installed. Besides offering AR capabilities, the Asus ZenFone AR is Daydream ready, which means it comes out of the box with support for Google's VR platform. Keep in mind that this is the second Android handset to hit the consumer market with Project Tango support. The first was the Lenovo Phab 2 Pro, which launched last November on Lenovo's website for $499.99. While it featured a larger 6.4-inch 1440 x 2560 resolution display, the ZenFone AR tops it in just about every other spec (except for the battery). The smaller screen might make Asus' AR-centric handset more appealing to the average consumer. Fast as usual, Asus. Only 7 months from launch till product available.